This has a strong argument for the strongest division overall. Lots of good matchups here. For what it's worth, I've set this one to stay open for three days instead of two just to make sure our weekday crowd can participate. I'll probably wait until Monday to post the first Round 2 poll as well. I took all the favorites except for the 11 seeded Friday the 13th. I don't see much of an argument for any of the other under dogs. 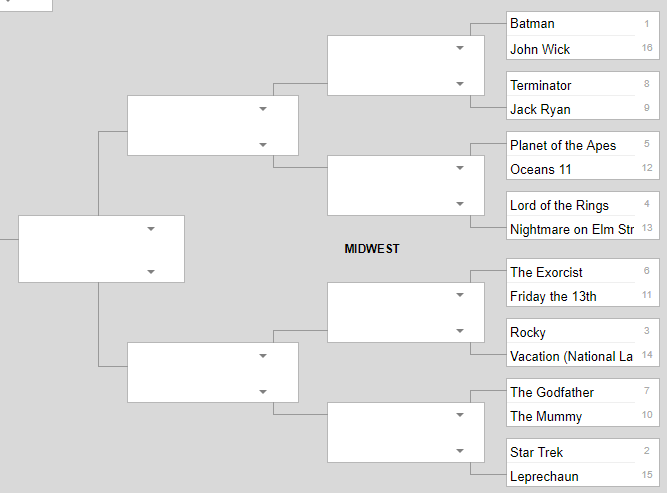 This is a tough division with Batman, Rocky, and The Godfather. However, it would be a travesty for any other than the Godfather to reign supreme. Say what you want about Part III, the strength of Parts I and II, two of the greatest movies of all time, should carry the franchise to a well deserved victory. John Wick got a terrible seeding and matchup. Wow. Good ones here. I expect LOTR and Godfather to battle it out. Man. Wick got hosed. If Nolan doesn’t exist Batman doesn’t even compete. Rocky vs Vacation was tough for me. Looks like it's pretty close so far for the group too. 8,9 was a tough one for me. I really enjoy both franchises. Terminator is really good. But I just couldn't put it over the Jack Ryan movies. Since this is just a giant time waster, I wonder if we should have some sort of secondary vote for the losers who just drew tough matchups in round 1. Maybe just another all in one, vote for your favorites kind of deal. I'm open to suggestions about format (or even suggestions just not to do it). Yes Alien needs a shot at redemption. Batman over John Wick since I don't know what John Wick is. Terminator over Jack Ryan because Arnold is pretty cool. Planet of the Apes over Oceans because giant intelligent apes are pretty cool. Lord of the Rings over Nightmare. Ugh. I don't like horror, and I like Science Fiction even though I didn't like Lord of the Rings. So I'll give LotR a pass. Friday the 13th over Exorcist because...well, it was random, more or less. Not into either of them. Vacation over Rocky. The newest Vacation with Christina Applegate is the best one of them all. Mummy over Godfather. Purely a genre vote here. Star Trek over Leprechaun. Purely a genre vote.